The Power to be #1. Designed For 07 & Later EFI Sportster 883’s – 1200’s. When it comes to reliability and performance look no further. 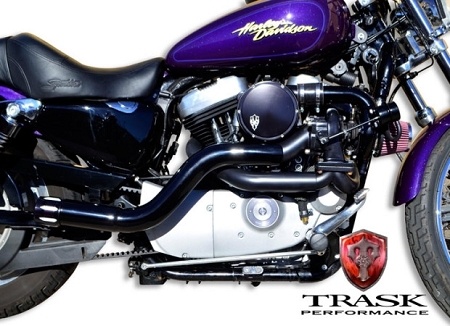 With its smooth, predictable, streetable power this turbo system is a much needed add on for any Harley rider. Whether it be cruising up and down the boulevard, coast to coast trips or canyon runs, this will put another level of fun to your ride. This system is designed as a bolt on for the stock Harley Davidson engine. No need any engine modifications. This systems makes peak HP and TQ right where you need it, between 3,000 and 4,000 RPM’s. This system is a 100% complete bolt on and runs on premium pump gas. The system provides smooth streetable performance. This system includes: stainless steel head pipe w/heat shields, steel tail pipe and heat shields, modified Garrett GT Series turbo w/8lb actuator, Trask plenum assembly with billet B.O.V., high flow air filter, billet boost gauge kit, a complete hardware kit, step by step instruction packet and mapping CD. Offered in the following finishes:black on black, chrome & polished and black and chrome. This system requires the use of a tuning module (not supplied). 4995 points will be rewarded to you when you buy this item. Copyright © RuthlessPerformanceMotorsports.com, All rights reserved.